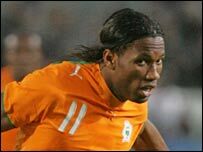 Austria beat Ivory Coast 3-2 in an international friendly in Innsbruck on Wednesday, despite a brace from Didier Drogba. Austria, co-host of next year's European Championship, had scored only three goals in eight previous games. Striker Sanel Kuljic converted a penalty kick to give Austria a 1-0 lead in the 30th minute. In the 53rd, Didier Drogba scored from a free kick just outside the penalty area to level. Ivory Coast was reduced to 10 players when Steve Gohouri was shown a red card in the 60th for fouling Markus Weissenberger from behind. Four minutes later, captain Andreas Ivanschitz converted another penalty for Austria to lead 2-1. Right wingback Joachim Standfest made it 3-1 in the 74th after a cross by Ivanschitz. In the final minute, Drogba scored from the penalty spot for his second goal of the match. Ivory Coast, which is preparing for the African Nations Cup starting in January in Ghana, had not conceded a goal in any of its eight matches since September 2006 under coach Uli Stieleke. In other international friendlies played on Wednesday South Africa were beaten 2-0 by world champions Italy, thanks to two late goals from Cristiano Lucarelli. Morocco ran-out 2-0 winners against Namibia. Tunisia were 1-0 winners against the United Arab Emirates.